Driving a manual ATV isn’t as hard as it appears. Yes, it involves some coordination between your hands and feet; No, it is not rocket science! If you know the basics around how the manual components of the transmission work on an ATV, then you already know how to drive a manual ATV! If you don’t then keep reading to learn more. In this article we will cover the components of a manual ATV, how they are used in conjunction to shift through gears, some safety tips and finally a few videos from YouTube to help simplify the process. Hold on tight and let’s shift into first gear (get what I did there???). Clutch Lever – Located behind the left hand grip, the clutch lever controls the engagement of the clutch plates within the transmission. Foot Shifter – Located next to your left foot. Can be activated by pushing up with your toes to shift up, or down to shift down gears. Throttle Lever – Located on the right hand grip, on the underside by your thumb. Activated by pushing forward to increase engine RPM. With an automatic transmission, you place the vehicle into Park or Neutral to start the motor. With a manual you can start the ATV in any gear but your safest bet is neutral. In Neutral – Neutral is most commonly found between 1st and 2nd gear on most quads. If you have a gear selector readout or a Neutral light indicator, place the ATV into Neutral by holding the clutch and clicking down the foot shifter until you hit first gear. Then do a half click up into Neutral. Now push the start button, or pull the pull cord to start the engine. It should idle on its own. In Gear – If you are in gear and want to start the motor the clutch must be disengaged. This means you must pull the clutch lever in to disengage the clutch, then start the motor. Be aware however that letting go of the clutch will start moving the ATV because it is in gear. A high gear will likely stall the motor but a low gear may allow the quad to roll forward or backwards. The two problems most people have when driving a manual ATV for the first time are starting from a stop and upshifting. But it’s really not that’s difficult when you know the process. Once you overcome the uncertainty, you will see it’s very easy. To start, place the ATV in neutral and pull in the clutch lever. Shift down by pressing the foot lever down 1 click to activate 1st gear. Using your right thumb, push the throttle lever slowly forward while also releasing the clutch lever. The clutch should engage and the ATV will move forward. Once you feel the clutch engage, you can let go of the clutch. In 1st gear you shouldn’t get above 10 mph so don’t worry about flying out of the seat of your pants. ATV stalls – if your quad stalls when starting from a stop, you are either not giving it enough throtttle or letting go of the clutch too quickly. Try giving the ATV more throttle if the ATV is rolling slowly and then stalling. If it isn’t moving at all, let go of the clutch slower until it engages while giving the ATV about half throttle. 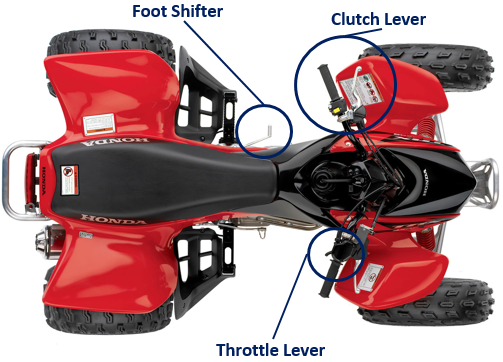 ATV Tilts/Lifts Upward – your ATV lifts up or wheelies when you let go of the clutch, you are giving it too much gas. Release the lever to lower the RPM and let the clutch out slowly. Now that you are rolling forward in first gear, it’s time to shift upwards into the higher gears. Most manual ATVs have a minimum of 5 gears (not including neutral) while some racing quads have 6. Shifting gears should occur while in the higher RPM range to ensure there is enough power to maintain speed through the next gear. Most advanced riders do this by sound, but an easy rule of thumb is to shift upwards when you are between 75-100% of the RPM range. Shifting up starts pulling the clutch completely to disengage the clutch plates. You should also let off the throttle a bit so that it doesn’t redline. Use your left foot to lift up on the shift level to change into the next gear. Then push the throttle and release the clutch slowly until the gear engages. Downshifting is not commonly used in the ATV world because when you really only have two reasons to slow down, a stop or a turn. Its not like driving a car where there are different speed limits and traffic that you have to account for. On an ATV, downshifting is done to match the gear with the speed of the ATV. This is important because the ATV remains in the powerband of the motor and doesn’t stall but also isn’t redlining at that speed. To downshift, start by pulling the clutch in to disengage the drive while applying the brakes to slow down. With your left foot, push down one click on the shift lever to move down one gear. Apply throttle and release the clutch slowly to reengage the drive. Match the throttle with the speed of the ATV. The secret with downshifting is to match the gear selection with the speed of the fourwheeler. If you don’t have a speedometer this can be quite tough. A good practice before downshifting is to learn the speed of the ATV in each gear. What does it feel like? What does it sound like? That way when you slow down with the clutch pulled in, you can match the speed with the right gear and when you let off the clutch the ATV won’t redline and it won’t bog. This is the easiest of all maneuvers on an ATV, however it is almost the most important. Speed doesn’t hurt. Stopping from a high speed does. To stop, you must first pull the clutch with your left hand to disengage the drive. Then using your right hand and right foot, apply the brakes to slow down. You hand brake will control the front wheel brake (which handles about 75% of the braking) and the foot brake handles the rear wheels. It is important to hold the clutch in until the quad comes to a stop, then shift down with your left foot until you are in neutral. Then you can release the clutch without stalling the motor. Actually, the bear tracker 250 does not have a clutch. You shift only with the foot. My Artic Cat 400 does not have a hand brake. Would I just use the foot brake by my right foot? Yes, on ATVs that don’t have a hand brake installed, the foot brake by your right foot is your best option.